The Centers for Disease Control and Prevention (CDC) is seeking to ban all tobacco use at every work place in the country, including businesses that operate primarily outdoors. The agency published a Current Intelligence Bulletin (CIB) on Friday that would advise the few workplaces that still allow smoking to end the practice, specifically targeting blue-collar workers in the construction and mining industries. The document, which will be open to public comment for 30 days, provided multiple recommendations from the CDC’s National Institute for Occupational Safety and Health (NIOSH). Among them: ban smoking in outdoor work areas and have bosses ask which of their employees smoke so they can "promptly provide encouragement to quit." "Establish and maintain tobacco-free workplaces for all employees, allowing no use of any tobacco products, including but not limited to cigarettes, cigars, pipes, and smokeless tobacco products by anyone at any time in the workplace," the document reads. "Ideally, this should be done in concert with an existing tobacco cessation support program." The best scenario, according to the CDC, would be restricting smoking outside. "At a minimum, the tobacco-free zone should encompass all indoor areas with no exceptions and no indoor smoking areas of any kind (including separately enclosed and/or ventilation areas), as well as areas immediately outside building entrances and air intakes, and all work vehicles," the bulletin said. "Optimally and whenever feasible, the entire workplace campus, including all outdoor areas, should be established as tobacco-free." "All tobacco-related restrictions and prohibitions should be equitably enforced," it added. In addition, under the policy employers would have to provide pamphlets on the health risks of smoking to all its workers, including contractors and volunteers. Businesses would also have to "inform all workers about health risks of tobacco use" and "about health risks of exposure to" second hand smoke (SHS). The document argues that SHS is equally dangerous to tobacco use, despite studies that have found no connection between passive smoke and lung cancer. The CDC says there is "no risk-free level of exposure to SHS," and that ventilation systems and smoking rooms are not sufficient to meet the proposed guidelines. Employers would be required at a minimum to provide phone numbers for quit lines, "self-help materials," and "provide employer-sponsored cessation programs at no-cost or subsidize cessation programs for lower wage workers to enhance the likelihood of their participation." Another recommendation reads: "Ask about personal tobacco use as part of all occupational health and wellness program interactions with individual workers and promptly provide encouragement to quit and guidance on tobacco cessation to each worker identified as a tobacco user and to any other worker who requests tobacco cessation guidance." The CDC also wants employers to provide cessation programs to their workers’ dependents "where feasible." Seventy-three percent of all workplaces in the United States are already smoke-free, according to a 2005 survey cited in the proposal. Most major cities have laws prohibiting smoking indoors, in restaurants, and bars, and 26 states and the District of Columbia also have prohibited smoking in workplaces. There are some exceptions. Members of Congress are allowed to "smoke as much as they would like in their private offices." The CDC would like their recommendations to apply to all workplaces, including the Capitol building, casinos, airports with smoking rooms, and Major League Baseball. "NIOSH recommends that all employers establish and maintain tobacco-free workplaces for all employees—allowing no use of tobacco products including smokeless tobacco—and adopt a Total Worker Health approach which integrates occupational safety with health promotion, such as smoking cessation programs, to prevent worker injury and illness," said Stephanie Stephens, a health communications specialist at the CDC. "I want to emphasize that any recommendations that NIOSH includes in the final version of the Current Intelligence Bulletin are only recommendations, not requirements," she said. The CDC’s goal is to curb smoking in industries with the highest rates of tobacco use, their main target being male blue-collar workers. 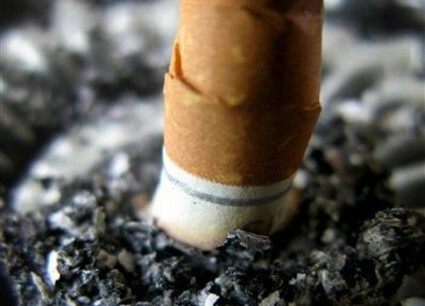 "Over the past several decades, a number of studies have assessed smoking habits among U.S. workers," the bulletin said. "Consistently, these studies have shown substantially higher smoking prevalence among blue-collar workers compared with white-collar workers, particularly among males." The bulletin specifically cited construction (32.1 percent), food service (32.1 percent), and mining (30.2 percent) as industries with the most tobacco use.